C. Vibius Varus was one of the moneyers for the year 42 BC. He is not otherwise known. 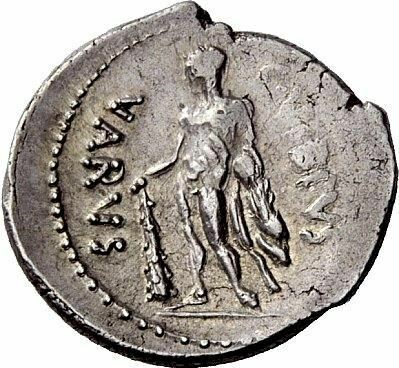 Gens Vibia was a minor plebeian family which first appears after the Second Punic War. The first member to attain the consulship was C. Vibius Pansa Caetronianus in 43 BC. The cognomen 'Varus' means 'bow-legged'. I could have been a family name, or perhaps a personal name.